I mostly liked the book. I thought it was really sweet that Bella became so close with Renesmee even though she couldn't really see herself being a mother at first, and she didn't get a lot of time to bond while the baby was in the womb. But, I thought the story line was a little bit unrealistic and very, very unclear. I mean, as far as we were concerned, vampires couldn't make babies, so what happened there? But, that was really the only thing I didn't like. And may I just say, I LOVED that Jacob imprinted on Renesmee... because now he gets to be with Bella and not feel sad or mad or what have you about it. It's a good thing that's the only part you didn't like, because I can help with that. Bella's pregnancy was explained. Breaking Dawn reveals that Edward is an Incubus, meaning he has the ability to impregnate human "victims", but Edward is not a sadistic killer so he didn't know he fell under that category. There are a couple instances when the Incubus is mentioned. 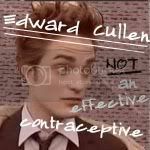 It was never said that vampires can’t impregnate -- vampires just can’t have children. As stated in the book, a woman vampire’s body cannot adjust to carry and birth a child; their bodies are frozen in time. Well, Bella was not yet a vampire. SM offers a more in-depth explanation on her website, but here's the gist of it: vampire men may not have what we call blood or sperm (they don’t have what we would call skin, either) but in SM's world, they do have genetic makeup in their venomous fluids, which act like blood. She had this figured out from the beginning of the saga when Bella did her vampire research. SM herself stumbled upon the Incubus and knew that’s what Edward would be. She kept it a secret for the element of surprise. At some point, whether we liked it or not, Bella would get pregnant and have a child with Edward. So for the remaining books, SM planned the inevitable and was careful with her words. You can see that if you re-read those conversations between Bella and Edward. I want to make this clear because a lot of Twilight fans are disappointed with the whole Renesmee situation. Location: in the meadow watching Edward sparkle. So I've been reading through the posts here and it seems like most people have the pretty much the same things to say about BD. I read the whole series in a about 4 days. Yeah, my life basically went on hold during the time. When I picked up the books, I had no idea what they were about, or how popular they were. A friend recommended them and a few months after she mentioned it, I was in need of a book to read to I picked up Twilight. Which lead to a trip back to the bookstore the next day for New Moon. Needless to say, in those four days I was completely immersed in the Twilight world. When I finished BD, I just felt like something was off. I liked it, just because it was a part of this world that I had fallen in love with and it definitely had it's shining moments. But for me, there is only one thing that was blindingly wrong with the book. When I read it, the pregnancy didn't bother me, Jacob's perspective was interesting (although I have to admit as soon as I saw that there was a Jacob POV, I immediately flipped through the book for Edward's POV and was disappointed that there was none), Bella turning into a vampire was a given for me and I was glad that I didn't have to read about her being a crazed newborn. Even the end fight scene was okay for me. But the one thing that bothered me the most was the lack of Edward in the book. I had fallen in love with this world where there was this man who cared so deeply about this girl. And she cared the same way for him. Nothing could keep them apart and they would do anything for each other, because the world could not exist without that person. ...And then suddenly that was gone. And I missed it in the book. I wanted to read about what their relationship was like when they were on an even playing field. When Bella didn't have to be so self conscience. 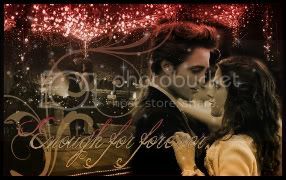 But I felt like with Bella became a vampire, her fascination with Edward decreased and Edward became a side character. That is what has me on the fence. This beautiful amazing relationship that we all dream about suddenly became something that was taken for granted. Anyway, sorry that was so long, I've been wanting to get that out for a long time. Thanks for reading, and if you'd like to PM with your thoughts,I would love to talk to someone about it. WOW. This is really interesting. I had never looked at Breaking Dawn this way, but I see your point. Maybe that's why I felt like something was missing a lot of the time. Most of Breaking Dawn was about Bella and her struggles and not as much about her relationship with Edward. When I start thinking about it that way...I realize that you're right. I had missed some of that interaction. But, in general, I love it...and I think Stephenie did a great job tying everything up....though it wouldn't bother me if she decided to write a 5th and 6th book!!!! EdwardNJessi wrote: WOW. This is really interesting. I had never looked at Breaking Dawn this way, but I see your point. Maybe that's why I felt like something was missing a lot of the time. Most of Breaking Dawn was about Bella and her struggles and not as much about her relationship with Edward. When I start thinking about it that way...I realize that you're right. I had missed some of that interaction. But, in general, I love it...and I think Stephenie did a great job tying everything up....though it wouldn't bother me if she decided to write a 5th and 6th book!!!! - it was well written. The honeymoon chapters, the wedding, Jacob's feelings, the birth (gory, but realistically so), Bella's first moments as a vampire, the hunt, the Volturi. Beautiful description. - Bella's vampire power. I LIKED the shield thing. It made sense, and was in line with her "safe mind". Unlike all those horrid fanfictions where she's got every single power known in the comic book universe. - It was funny. The funniest of all 4 books, I'd say. Everything from "why am I covered in feathers?" to "it's about time somebody scored around here". HA HA. - Characterization. Leah, Jacob, and Bella all scored in this category if you ask me. - New characters. Yes, this was confusing at times and hard to follow. But admit it: you were interested. - The Volturi's involvement was very well played out. And it was good that there was no fight at the end. Loads of people would have died, and SM has proved that characters don't need to die in order to make a good story. - Bella's pregnancy. WAIT. Don't freak out. Listen to why. For the first 3 books, people loved the way that you could RELATE to Bella. Even if you've never fallen madly in love, jumped off a cliff, or had to choose between 2 hot guys, relating to Bella was easy and natural. For me, the pregnancy thing? Not so easy to relate to. How are the majority of un-pregnant readers ever going to understand what it feels like to be a mother? There's a line in the book...(I think Bella says it to Kate) that goes something like "she had never known the passion of a mother for her child". Well, Bella, neither have I. - Bella and Edward's relationship. Brilliant in Book One. Great in Book Two, despite the circumstances. Now we come to book three. Sigh. What makes the Twilight saga stand out is the human/vampire romance. Of course, Bella eventually HAD to become a vampire. It would have killed us if she had just stayed human. But did anyone else feel like Bella and Edward seemed just like any other vampire couple in Part 3? They'd lost their uniqueness. - Renesmee's character. How much louder can you scream Mary Sue? Yes, she's Edward's daughter and Edward is perfect...to an extent. He's got his flaws, even if Bella doesn't care about them. Renesmee lacked character, and she didn't seem real. - Children of the moon. Bah. Need I say more? - The sugar sweet, no-pain happy ending. That's wonderful for Bella's family, but what are we supposed to make of that? I agree 100% with your post. The minute Bella got pregnant I was pulled out of the story. I don't know why, but I didn't want her to have a child. I don't have children, but I know that the minute you have a child, your life completely changes because your focus changes. And I didn't want to the focus on the book to be on the child and Bella's relationship with the child. I wanted the focus to continue to be on Edward and Bella. And what you said about Bella and Edward being like any other vampire couple in part three is spot on. I just felt like something was lost between them when Bella became a vampire. Edward was no longer a mystery to her and Edward no longer needed to be as protective. It was a good book, like it's been said there were definitely good parts. I guess I just wanted more of the love story. ^Definitely. It wasn't about romantic love anymore. It was motherly love. And I like babies just as much as the next person. But the concept of motherhood has me going "Whaaaat?!". It felt strange to me that Bella wanted the baby so much, and was so in love with it that fast. I don't care about the "anti-feminist" aspect of it (actually, I disagree with that), but in my opinion, a pregnancy is not the way to end a vampire love story. Yeah, I agree. Reading, I hadn't really realized that it shouldn't be possible for Bella to get pregnant, I hadn't listened to interviews or anything like that. But when it was discovered that was what was wrong with her, I was like, what?! no! Now Bella was willing to hurt Edward...I mean, didn't she see how much it was killing him to watch her go through the pregnancy? It just seems so unBella like to hurt him so bad. With Jacob's description of Edward, I don't know why Bella would do that to him. It bothered me that she just didn't seem to care. I know we weren't in her head, so we don't know what their private moments were, but I still found it shocking.